Unprecedented results for Beautiful Skin! EQUOL is an exclusive and patented Ultimate Anti-aging Molecule that restores the foundation of skin. EQUOL recalibrates the effects of hormonal imbalance due to aging to restore skin’s youthful appearance. As we age, our hormone balance also changes and our skin no longer has the ability to create healthy architectural components or fight off the MMPs that degrade them. Equol recalibrates and optimizes hormone effects to a more youthful balance. Aging affects the expression of genes in skin. 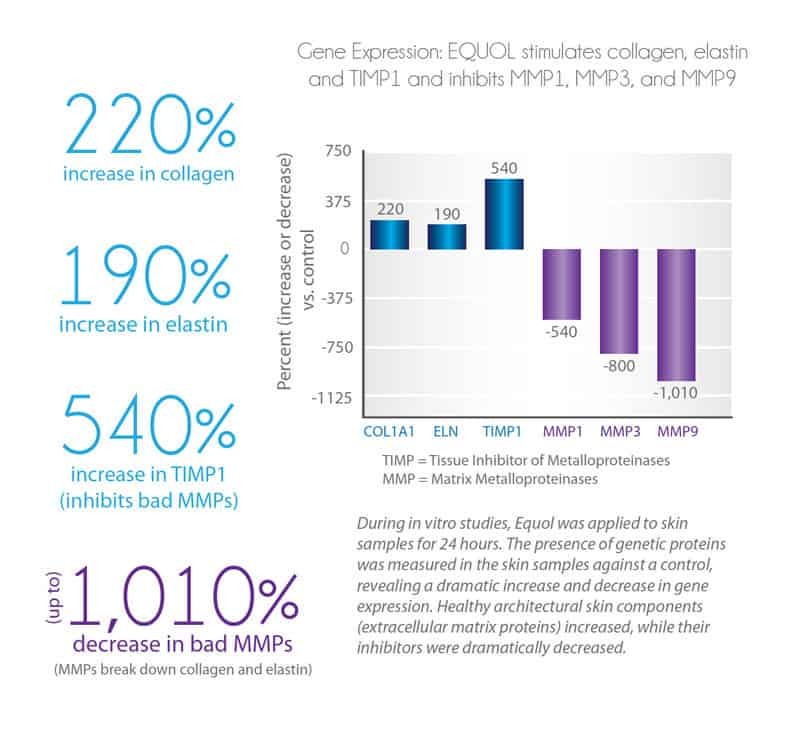 The production of collagen, elastin, and other healthy skin architectural decreases and bad enzymes (MMPs) increase in skin. Equol works with your genes to reverse these negative effects in skin. Not only does it dramatically boost your skin’s ability to produce collagen and elastin, but it also inhibits the MMPs that break down youthful skin. We simply offer the highest quality products and best customer care to our customers. You may also purchase our products on Amazon with your Prime account. We guarantee fast shipping and handling. Please note that Yü Anti-Aging Essentials Kit is not our product and shipped by a third party vendor. This might take 5-7 business days for processing and delivery. We guarantee the top quality of our products. Return policy is applied to AgeImmune products only. If you feel this product does not work for you, you can return it and request your 100% money back refund. Stay tuned to our latest news and release of exiting products. We promise not to spam you, or share your info.